"Namespace or type specified in the Imports 'Microsoft.Practices.Enterprise.Library.Data' doesn't contain any public member or cannot be found." Tonight, while working on a new project, I encountered the following error when trying to use Enterprise Library (EL) Data Access Application Block from Microsoft's Patterns & Practices. This error caught me off guard because I've used EL a lot before. Somehow, when I created the new project in Visual Studio 2010, I must've selected this project to compile based on the target framework ".NET Framework 4 Client Profile" instead of the typical ".NET Framework 4". For those of you that run accross this error. 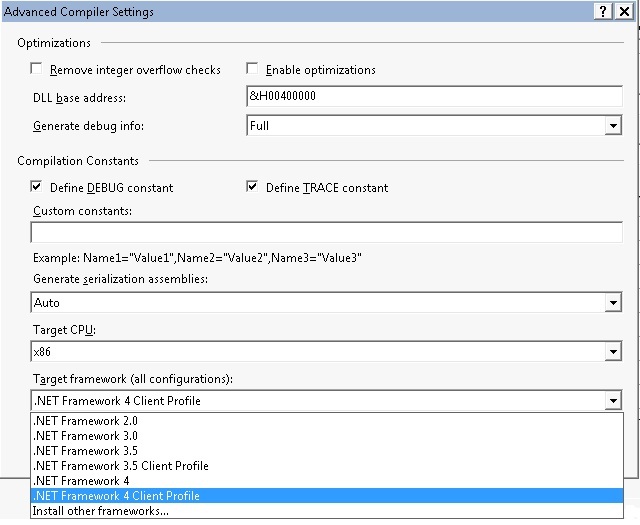 Check the "advanced compile options" under your project properties.